InfoSWMM and InfoSWMM SA offers an advanced RTC rule that could be used to effectively simulate the operation of pumps and flow regulating structures such as weirs, orifices, and outlets. Unlike Simple Controls, RTC rules allow for the creation of multiple conditions to be satisfied before a control action is performed. RTC rules make the definition of complex operational logic for pumps and interdependent regulators fully transparent and time efficient. Each regulator or pump operates under the control logic encapsulated into a set of simple logical rules and control functions. The system allows a schematized definition of any form and size of decision tree due to the flexibility of InfoSWMM ‘s Rule Format, featuring conditional clauses, action clauses and logical and conditional operators including IF, THEN, ELSE, AND, and OR in any combination. 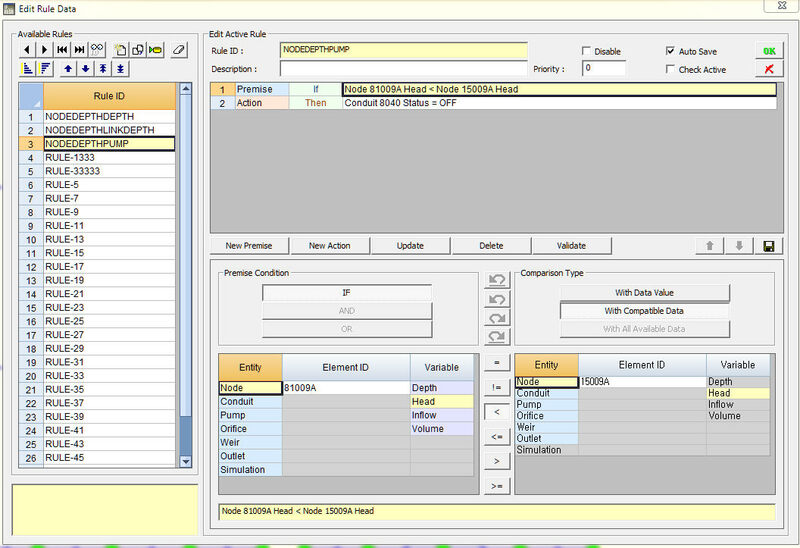 InfoSWMM ‘s RTC Rule Editor immensely simplifies the process of creating this potentially complex and challenging operational rule. Select Operation from InfoSWMM and InfoSWMM SA Browser. Expand Hydraulics by clicking on the sign, click on the Real Time Control (RTC) Rule and create one. 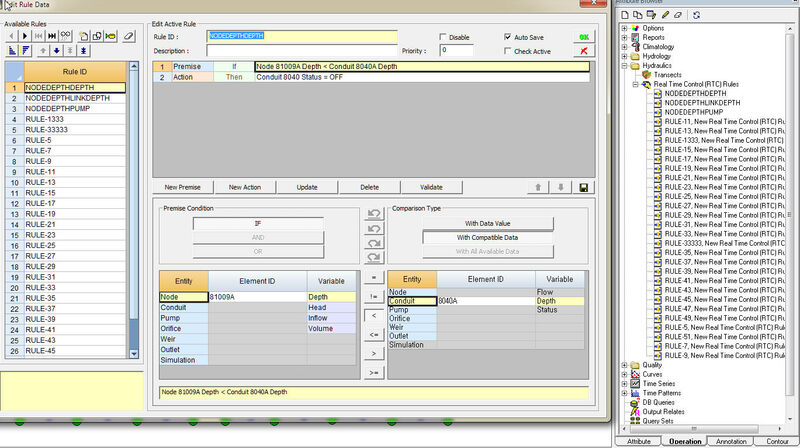 This initiates the RTC rule editor shown below. Priority Used to specify a priority index (value) for a given control rule. The priority value is used to determine which rule applies when two or more rules require that conflicting actions be taken on a link. A rule without a priority value always has a lower priority than one with a value. For two rules with the same priority value, the rule that appears first is given the higher priority. A rule with higher priority value (e.g. 2) has a precedence over the one with lower priority value (e.g. 1). Disable Used to disable or deactivate a given control rule. If unchecked the rule is considered active or operational. Type – indicates if the statement summarized on the line is a premise (condition) statement or an action statement. IF, AND, or OR could precede premise statements. Action statements could begin with THEN, ELSE, or AND. Key Word – specifies the conditional or logical identifier that precedes the statement given on the line. Key words could be one of IF, THEN, ELSE, AND, or OR. Rule Statement – summarizes the condition to be satisfied before the action takes effect, or the action to be taken when condition(s) are satisfied. Update – saves the control rule(s) available in the region to a database and closes the RTC Rule editor. Insert – inserts the rule settings specified in the Rule Clause Data region into the Rule Statements region. Delete – deletes the highlighted rule. Clear – clears all the rules, not just the highlighted rule, available in the Control Rules region. Validate – Checks and validates if the specified rule statements are acceptable (valid), and issues an error message if the statements are logically invalid. Move Up ( ) and Move Down ( ) Icons – Enables changing the sequence of appearance of some of the rule statements. Not all statements could be moved up and down. Rule Clause Data This region contains subregions that enable selecting and editing of desired control rule data. Data Type – In this subregion the user would select the type (premise or action) of the control statement, and the corresponding Key Word for every rule statement created. Premise statements are conditional statements that needs to be satisfied before control action is taken on the link. Premise statements could take one ofIF, AND, or OR key words. Action statements are used to specify control actions to be taken on a pump, an orifice, a weir, or an outlet when the condition(s) given in one or more premise lines, preceding the action line, are satisfied. The key words that could go with action statements are THEN, ELSE, or AND. Object -This subregion is used to specify the InfoSWMM and InfoSWMM SA data object whose hydraulic attribute is used as a controlling variable in thePremise statement(s),or is used to indicate the link for which the control rule is being developed as indicated in the Action statement(s). The table given below summarizes the objects that could go along with the premise statement and the action statements. ID of the object could be typed in the box or the modeler could select the object from the study area map by clicking on the button and selecting the object. Attribute – This region allows selection of the hydraulic attribute to be used as a controlling variable (for premise statements), or specifies the applicable action word (i.e., Status or Setting) for action statements. Acceptable attributes for each object are summarized in the table below. Relation – used to specify the equality/inequality that applies to the rule. See the table below for applicable relations. For more information on PID Controls click here. Value – This region is used to edit or select an attribute value or ID to be used as a point of transition to put the control action into effect.